North Palisade is a California 14er and the third highest mountain in the Sierra Nevada range of California. 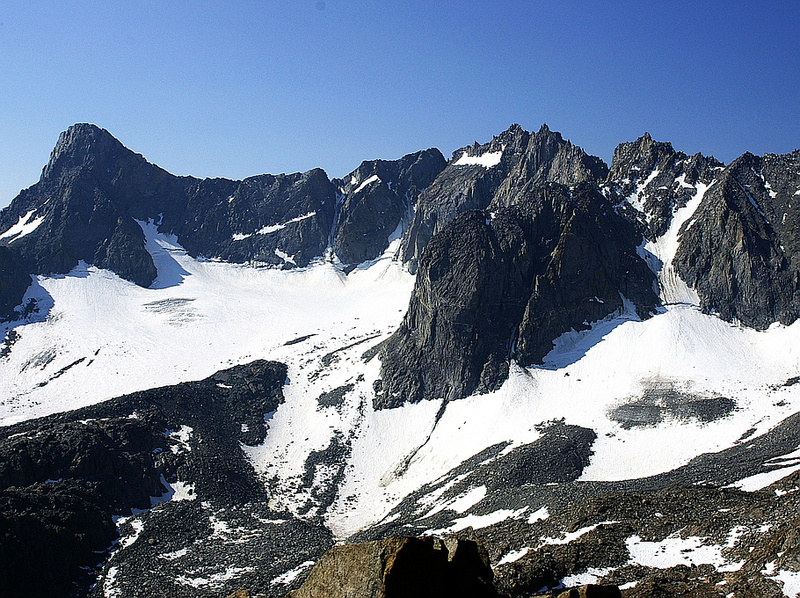 Highest peak of the Palisades group of peaks in the central part of the Sierras. Sports a small glacier (the Palisade Glacier) and several highly prized rock climbing routes on its northeast side. The easiest route is the class 4 LeConte Route, but the most popular route is the class 5 U-Notch Couloir, a California mountaineering classic. North Palisade has several named subsidiary peaks over 14,000 feet. These all lie on the main ridge crest, and are as follows: Polemonium Peak, Starlight Peak (known for its famous "Milk Bottle", a 20 ft pillar of rock which huge exposure with a climbing grade of about 5.6), and Thunderbolt Peak.